Our years of experience and ongoing investment in the latest digital printing technology enables us to print direct onto foamex board at almost any size to suit most requirements - from small scale display boards to large scale fit-outs. We stock digital print quality large format sheets up to 3000mm x 2000mm and these can be printed direct from your files in glorious colour. Please specify what kind of Foamex product you are after and we will get back to you as soon as possible. 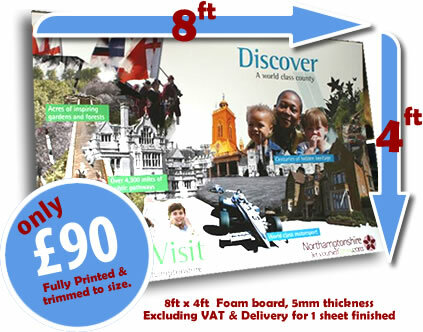 A high impact 8ft x 4ft foam board - only £90 for a limited time! "Amazing service and such a refreshing can-do attitude at all times, highly recommend these guys!"